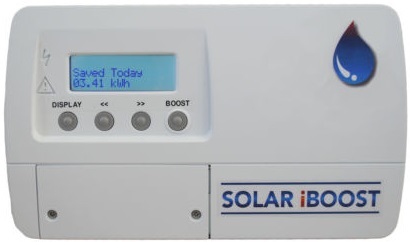 While virtually all multi-kW solar PV arrays are supplied with a digital display unit to show the amount of power being generated, it is very difficult for the non-electrician/expert to use that (or to start cutting into cables etc) in order to detect when the power generated is above a certain threshold. If for example you have a 9kW solar array, and want a 3kW immersion element to turn on in a hot water tank when the solar power generated exceeds 4kW, things could be quite complicated and expensive. In order to avoid the need to mess around with the solar array and associated cables and electronics, we have come up with a simple device which operates completely independently of the solar array, but which will turn on an immersion heater whenever solar output is high enough. When the user knows that the solar panels are generating just a little above the target power level (from the readout on their digital display), they press a button on the controller. This calibrates the controller so that whenever the LDR measures that it is brighter than this user-set threshold, the controller will know that the power being generated by the solar array exceeds the target and therefore turn on the immersion element. When the LDR measures the light level to be lower than the threshold, the controller will know that the power being generated by the solar array is less than the target and therefore will turn off the immersion element. 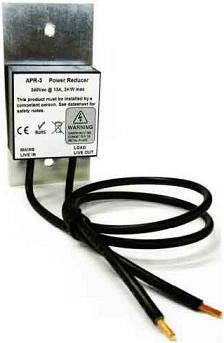 The immersion element itself is turned on and off using a relay switched by the controller. In order that the immersion element is not turned on and off rapidly and repeatedly when the light level is very close to the user-set threshold, we have added some timers to the controller. The immersion element is only turned on after 5 continuous seconds of the light level being measured to be greater than the threshold. Subsequently, the immersion element is only turned off again after 2 continuous seconds of the light level being measured to be below the threshold. When choosing the threshold level of power generation at which the immersion is to be turned on it is essential to consider the background level of power used in the house – for example, the fridge, WIFI routers, computers, lighting, and devices on standby will be drawing power all the time. At least 1kW should be added to the power rating of the immersion element – e.g. use a threshold of at least 3kW if the immersion element is rated at 2kW. The key thing is not to find yourself importing expensive electricity to power the immersion! Pictured above is the REUK surplus PV immersion element controller which is now available for sale in the REUK Shop. It is supplied with a high quality IP54 rated (splash and dust proof) enclosure, fitted with a relay rated to switch a mains powered immersion element of up to 3kW power. It is currently priced at £30.99. 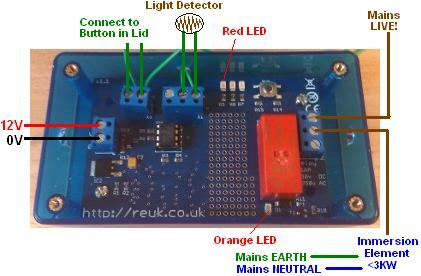 Click here to buy REUK Solar PV Immersion Controller now. The controller is to be connected as shown above. Note that the controller requires a 12V DC power source – either a battery or a small transformer plugged into the mains (which we can supply if requested). The light detector must be positioned so it is protected from the rain while also being able to see the sun – e.g. by covering it in clear silicone, epoxy, or fashioning a small shelter for it. The best way we have found to waterproof a light detector is using a baby food jar. Feed the contents to a baby, then wash out the jar and lid well. Drill a small hole in the lid through which you can feed the cable from the back of the light detector and seal around it with a dab of silicone. Use a dab of UV resistant clear silicone to stick the light detector to the inside of the base of the jar, and then attach the lid to the jar. Position the jar upside down so that the light detector is at the high point (to avoid condensation) pointing in the same direction as your solar array. Below is an image of the controller with the lid fitted, showing its calibration button. 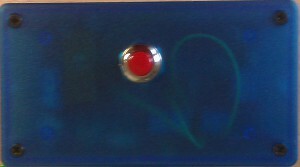 The box is translucent so the LEDs indicators within can be seen clearly when they are turned on. Press and hold the calibration button when the power being generated by the solar array exceeds your target. The red LED if it is off, will turn on, and stay on if it is already on. After 1/2 a second of you pressing the button, the red LED will turn off, and then at the instant you release the button the currentlight level will be saved and stored in memory and the red LED will flicker for a few seconds to give you confirmation of successful calibration. You can re-calibrate the system at any time, but it is only necessary to do so if you want actually want to change the light level threshold. You do not need to re-calibrate if for example you cut the power to the controller since the current settings will not be lost from memory. In operation, when the red LED is lit up, it means that the light level being measured exceeds the threshold. When the orange LED is lit up it means that the relay is closed and therefore the immersion element is heating water in the tank using your excess solar generated electricity. Warnings! 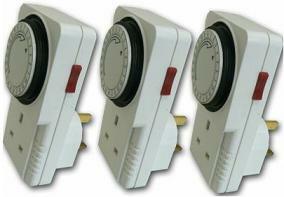 A qualified person should install this system since it involves mains electricity. The immersion element MUST have a thermostatic override to prevent the water in the tank from being heated to dangerous levels when it is very sunny or in the unlikely event of a controller malfunction. Since most people have 4kW or less of installed solar power, a standard (and easy to find) 3kW immersion element may not be suitable in some cases. Therefore a (much harder to find) 1kW or 2kW immersion element would be preferred. 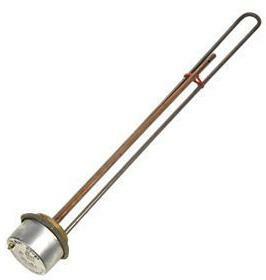 1kW Immersion Heaters can often be found here. Another option is to use an immersion power reducer which enables a standard 3kW immersion element to be powered at just 1.5kW power. If you are interested in purchasing one of these immersion controllers (or something along similar lines), please email neil@reuk.co.uk with details of your exact requirements. Our light detector based controller estimates the solar gain, and it does not take into account the amount of electricity already being used in the property. Therefore there will be times when electricity is being imported to the property to meet a shortfall when a lot of power is being used in the property – e.g. when the kettle is being boiled. Pictured above is a product which comes with a clip-on current measuring device which measures the instantaneous net current (solar generation minus domestic consumption) being exported through the electricity meter. It supplies only this amount of power to the (standard 3kW) immersion element automatically to make best use of surplus PV solar generation. This device is called Solar iBoost and is available here: buy Solar iBoost from around £180.